Israel - McDonalds in Israel will have to find replacements for 800 youths who have worked at the fast food chain on Shabbat in the past, beginning this Saturday, as Israel’s Ministry of Industry, Trade and Labor begins to enforce a law that ensures young people do not work on the Jewish sabbath. The teenagers want to work on Saturday, a local McDonalds Israel manager told Globes. Employees in Israel earn 150% of their normal hourly wages on Saturday. I'm impressed. But it's puzzling at the same time, being that these young people are apparently not interested in keeping Shabbos and this move will hardly motivate them to do so. A better solution is to close shop on Shabbos, or at least to take the next step and be mekarev these youth and offer them a chance at becoming shomer Shabbos. Why is it illegal for teens to work on shabbos? Is it ok if your 22 years old but not if your 18 yeard?? The government should not be legislating halacha. No one should work on shabbos kodesh but thats a personal decision in a democratic society and the government should not be telling private employers and individuals what to do. I am curious, what would the Satmar Rebbe have said to this? What does Satmar say now? I have a feeling that they are as impressed as they were with Meir Kahane. Yet they couldn't say anything bad about him. Where are you getting your moral cues from? Who says that it's wrong to compel people to keep shabbos? Is that what you read in some goyishe philosophy book? Is this establishment certified kosher? If so, how can it be supervised on Shabbos? What does Rav Yolish's Z'tl opinion of an American rav who our own government designated a terrorist have to do with this new law governing shmiras shabbos?? To #7: First of all the law governing shmiras shabbos has been around since the inception of the State of Israel but it is apparently necessary for a formal ban since you now have goyishe establishments in Israel. Second, if you read correctly I did not allude to The Satmar Rebbe's opinion of Kahane - only the Satmars themselves (unless you are prepared to say that the Rebbe thinks for all) Third, it is obvious where your sentiments lie when you give such kavod to "our own government" branding Kahane a terrorist. Most Jews "own government" is the medinah that Satmar hates so much. Kahane was called a "racist" by them which though a severe slander is much better than being called a terrorist. And fifth, if Kahane who knew "kol hatorah kulo" and was one of the greatest minds of our generation was a terrorist, perhaps we should all aspire to be one. Standing on your toes to enforce a shabbas regimen might work, but in reality though these kids are really ridiculous for working in a mcdonalds on shabbas, the mcdonalds needs to be a little more lawful in Israel and not even open. Compelling people to do anything against their will is counter-productive. That's why demonstrations in Shabbat Square attract so much negative criticism. What happened to the concept of achieving objectives by דרכי נואם? 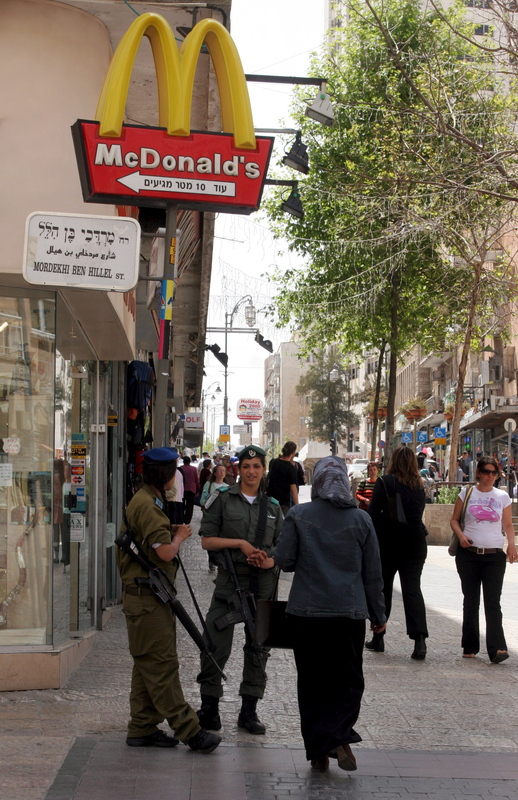 The kosher McDonalds are not open on shabbos (example - tachana merkazit in yerushalayim, both branches in Ra'anana). However, most branches of McDonalds in Israel are not kosher. This is about the non-kosher McDonalds. And for all those who will ask, yes there is both two non-kosher and one kosher McDonalds in Yerushalayim. The Rabbanut gave them a lot of trouble as this could lead to confusion, so McDonalds ultimately took the unprecedented move to change their colors at the kosher location in order to differentiate it. In all other countries, McD's conforms to local taste and customs. Only in Israel they refuse to do so. That is actually not a bad thing because their "food" is toxic crap. When did you last eat in McDonald's, Babishka? You sound so knowledgeable! We have many laws regulating employment of the minors in our country. Israel being much less free country than ours, much more rigidly regulated, must have even more of such laws. These laws exist ostensibly to protect our children. So if it is alright to limit the number of hours a minor can work and to restrict his work during school hours, why is it so wrong to restrict his work on Shabbos?